In Australia, the extreme temperatures noted two weeks ago are less intense. Victoria and Tasmania have benefited from rain. Western Australia tends to have the best hay growth. Drought related government subsidies continue to be available for transporting fodder, water and livestock. A mild summer continues to benefit the dairy industry in New Zealand. There is some anxiety within the dairy industry about changes that may come to dairy farming practices in New Zealand from the Zero Carbon Act to reduce carbon emissions. Butter prices in Oceania moved higher. Production volumes are anticipated to gradually decline while demand will remain good, so prices aren’t likely to decline in coming months. Manufacturers are aksi producing to increase stocks for late season needs. 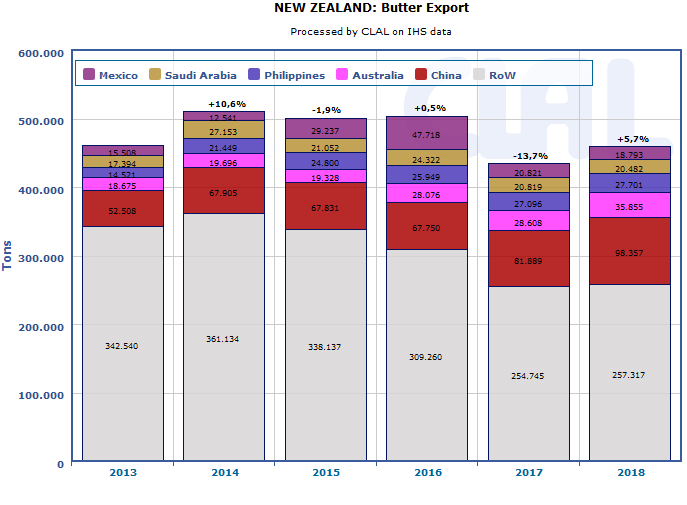 New Zealand Butter exports in 2018 grew by +5.7% compared to 2017, even though in the last two months of the year there was a slowdown. China is the main target market. Also for Australia, Butter exports increased (+1.6% compared to 2017), with Thailand and China as the first buyers. SMP prices in Oceania are higher. Near term SMP production is mostly committed. Exports of SMP in 2018 were below 2017 for both New Zealand (-9.7%) and for Australia (-1.1%), however, in the last months of 2018 a recovery was observed. China is the main importing country. Cheddar prices increased slightly. Manufacturers are producing heavy schedules with available milk to keep Buyers stocked. Cheese exports in 2018 recorded -5.7% for New Zealand and +0.7% for Australia. China decreased its imports, on the contrary, Japan, the main importer of cheese from the two countries of Oceania, increased its purchases. WMP prices are higher. Most Buyers don’t expect a trend price reversal in coming months. 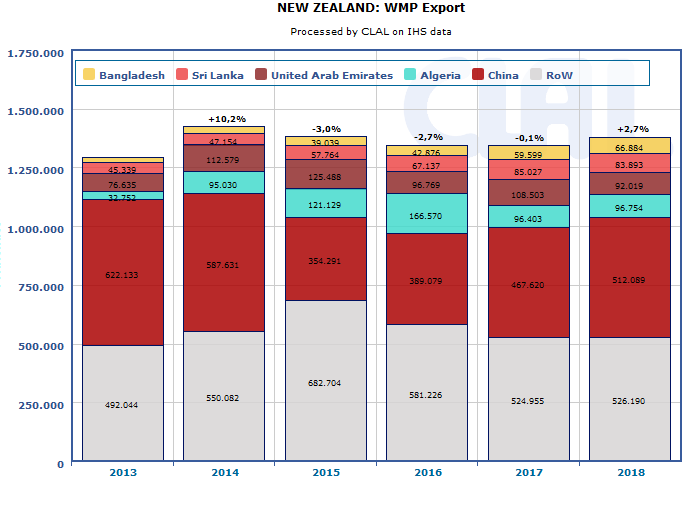 WMP export in 2018 was +2.7% than in 2017 for New Zealand, reflecting strong Chinese demand (+9.5%). Also in Australia, WMP exports remained above the previous year (+0.8%).